So what's next for Saul Alvarez, after his 12th round stoppage of Ryan Rhodes this past weekend? Well, it's full speed ahead on him fighting again as part of a split-site card alongside Victor Ortiz vs. Floyd Mayweather. Golden Boy Promotions CEO Richard Schaefer said on Monday afternoon, "I met with my matchmakers and we'll be meeting with "Canelo' in a couple of weeks but yes, the idea is to have him fight September 17th." As for who he'd face, Schaefer said, "I think if [Ricardo] Mayorga and King are not outpricing themselves, then it's certainly a possibility, as are a few others. 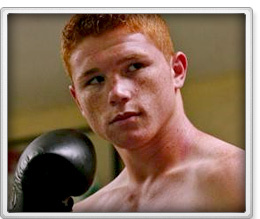 But again, we'll sit down with 'Canelo' and discuss with him what he wants to do next and then take it from there." Regardless of what is being said or reported, Vanes Martirosyan, who stopped Saul Roman in a WBC eliminator, is not Alvarez's mandatory yet. "He's not; Ryan Rhodes was his mandatory and I can tell you that when we negotiated with Hatton Promotions, they sure let us know that they were the mandatory," said Schaefer with a laugh, clarifying their position. "It cost us a lot of money, so he basically has no mandatory for the next 12 months." When asked about a possible future showdown with Julio Cesar Chavez Jr., Schaefer answered, "Well, we don't think Chavez is going to want to do that, to tell you the truth. We would do it. We'd have to agree on some sort of a catchweight but yeah, we would do it." Bob Arum, whose company, Top Rank, reps Junior, told Maxboxing on Tuesday, "We would love that fight; the sooner the better. The sooner the better; we'd forget everything and make that the next fight." As for what is next for his fighter, Arum said, "Chavez has been penciled in by HBO for November 19th and he may well fight in early September in Mexico before that."